+ Our house was originally a fairly typical inner suburban Victorian double-fronted timber home. In 2006 we decided to renovate and turned to Andreas and Judy Sederof from Sunpower Design. 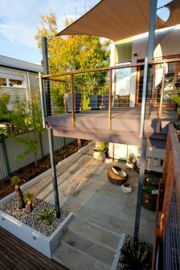 The brief was to create a contemporary home with the best energy efficient and water saving initiatives. We also required an open plan office space where we could run our growing business, Open Spaces Publishing. In October 2006 the builders arrived and quickly demolished the back of our house leaving only the front four rooms. After 9 months we moved back in. The front two rooms remained bedrooms but we added an ensuite and two windows to the master bedroom. The remaining part of the old house became the bathroom and second office space. The new addition was split with steps leading down to the large office, laundry, third bathroom (for the office staff) and wine cellar (NOT for the office staff). Another small room became the hub room where all the cabling in the house was terminated (network, security, coax and electricity). Upstairs our open-plan living area featured a split level, the highest of which became the kitchen. A split-level deck was added to the rear of the house. We took advantage of the fact that our house is orientated east west with the rear of the house facing west. This allowed up to create a series of large north-facing windows along the length of the building. These windows are double glazed (like all the windows in the house) and are protected from the summer heat with large external awnings and inner blinds. We have added sun sails to the rear deck which also protect the western windows from the summer heat.